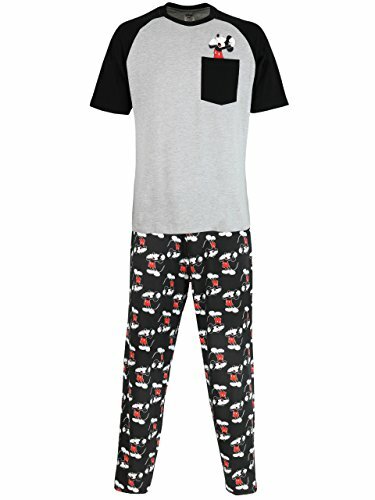 Disney Mickey Mouse pajamas for men. A cool pajama set every true Disney fan will love, it comes with a yawning Mickey patterned design. The short sleeved top has contrasting sleeves and a breast pocket, and the long legged bottoms come with an elasticated waist to make these Mickey Mouse Pjs even more comfy! The short sleeved top has contrasting sleeves in black and a breast pocket with a yawning Mickey on the top. A comfy option for bedtime every Disney lover will want!